My mother in law is 100% Swedish which makes my husband ½ (his father was French/Greek) and my kids ¼ Swedish for sure. So they are more Swedish than anything else. What they get from my side is a crazy mix (and I do mean crazy) of Irish, Italian, Mexican, Danish, Native-American, and more—the classic American melting pot of genes. In Sweden, our cousins took us to a Midsummer festival at their friends’ home, it was the first party we had been to thus far in the country where we weren’t related to everyone there. This was another small coastal town and at this party, like most of the others, everyone was Swedish—I realize that sounds stupid but I mean like Swedish/Swedish: Swedes marrying Swedes and making little Swedes. Many of them spoke English (and French, German, Italian etc.) and wanted to know what our story was…why was my husband fluent in Swedish? (He spent his Summers there growing up) and what was my story? Where was I from? Who were my people? What was my genetic make-up is basically what they were asking, and they were confused and surprised that I didn’t know more specifically who was above me on the family tree. But nobody asks that kind of question here in America. We are all just American and everyone assumes there is some kind of mix going on somewhere. Like I would never say, yes, we went to a 4th of July party and everyone there was American because unless someone is obviously visiting from somewhere and speaking another language or engaging in some sort of bizarre tribal ritual, we all just sort of splash happily around in the melting pot. Actually we’re all so worried about being offensive in any way that I think someone would have to be biting the heads off chickens before anyone would say anything. So back to the Swedish festival—filled with beautiful people with flowers in their hair singing songs on key and eating and drinking in moderation—very strange. But how strange for the teenagers (who, by the way were all on their phones the whole time just like American kids which made me feel better…about what, I’m not sure) to all be so good looking—like that’s just par over there—at least in this town…no gangly, acne ridden, late bloomers—just a bunch of Abercrombie models lying around braiding each others hair and playing video games. And guess who made all the girls swoon…including my two daughters? Gustav, the 14 year old, slightly paunchy, guitar playing, sleepy-eyed, future lothario who was the only kid there with maybe a little bit more foliage on his family tree…the only kid there with really dark hair…a bump on his nose and a funky glint in his eye. His daddy was Italian. He sat by me at dinner. He drank more than anyone at the party, cried and cheered when his son, Gustav finished his performance and he was the one leading the inquisition about my family tree! He was quirky, funny, charming, not handsome at all but utterly attractive and interested in the differences in life—not the sameness…homogeneity was not for him. Most of our families are more like Gustav’s—lots and lots of smiling faces peering out from the branches and none of them looking like anyone else. Genetics is a funny thing. Sometimes it’s incredible to see your friends replicated in their children—the same eyes peering at you from a tiny body, but more often than not we find ourselves wondering at the broad differences between siblings and our relatives and ourselves. We had 4 generations together on Christmas Eve. My 96 year old Grandma got very nostalgic and weepy…quite frankly we all were as was most of the country after the horrifying tragedy in Connecticut, but she was having a night where she just kept remembering. Every time somebody did something or said something it reminded her of someone else long ago, someone who looked the same or sounded the same…or someone who spun her skirt the same way or twirled his mustache the same way. My sister’s daughter from her first marriage told us all about her whole other Christmas she had with her Dad and his extended family and their traditions—some of which were the same and some wildly different. We all had our dogs with us as well—so much part of the family that no one could imagine leaving them at home on Christmas Eve! Earlier that day we had all been with different friends that we’ve known forever and are just as much family to us as the group that shared dinner later. Just as I find solace in knowing that there are more books out there than I could ever read so I will never run out and I will be able to experience all the different lives and all the endless possibilities in the pages of those books and won’t have to be content with this one life…the same goes for the people we love, the friends we have, the people we meet, the lives we allow to intersect with our own. There is a whole great big sea of humanity out there and we can expand our tiny existences by incorporating as many others as possible. Our beloved dog died a few months ago. Weirdly, my extended family actually has a little graveyard and that’s where we buried him. It’s a beautiful spot…surrounded by huge ancient oaks with dipping and diving branches—trees you have to climb, trees you could live in, trees that can shelter you and protect you. We buried him next to my sister’s dog and my dad’s horse and not too far from my Great aunt and uncle and one of my Dad’s best friends and one of our old ranch hands because they are family too. My husband and I cried quietly while the new dog loped over the sites reserved for my parents and my grandma and then disappeared into the brush. The girls climbed the trees over their family and friends while we closed that chapter of our lives and then whistled for the puppy so we could head home before the sun went down. Renee Carter has written an incredibly engaging and colorful story with a great message—all families are amazing! 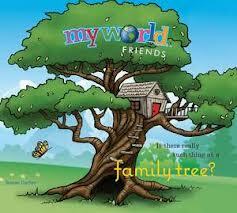 We are all part of a great big family tree, and we can create our own family trees any way we want to! What does it mean to kids to be part of a family? What does it mean to be a branch on a family tree? 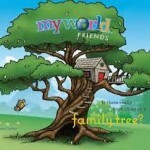 These are all questions the My World Friends ask in this special, important book. This is such a great book to read aloud and share with your children—lots of chances for conversations and discussions about families, friends, love and the joy we can find in each other—all good stuff! Happily, we can look forward to more from the My World Friends and more enchanting stories with valuable lessons from Renee Carter!